I managed to miss the I -challenge, which really bugs me, but I made the card anyhow... would hate to be missing one! 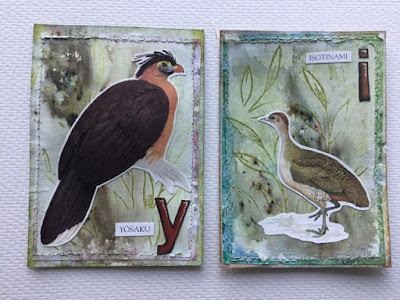 My I is for the great tinamou (isotinami, "iso" means large in Finnish) and my Y is for the nocturnal currassow (yösaku or yöhokko, "yö" means night in Finnish). Two South-American birds. Here they are, I'm posting for the Craft Barn Alpha challenge "Y" and the Paperartsy challenge (bleach). 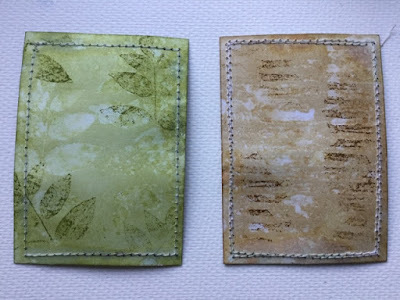 I sewed some scrap paper on the front of the cards and used Distress inks on the back. 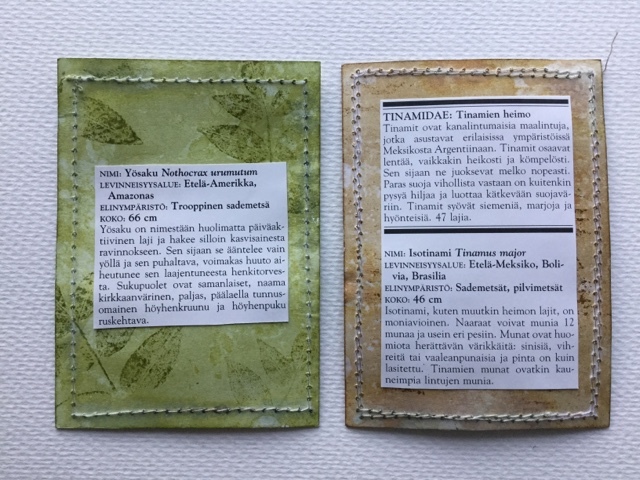 I used faux bleaching (stamped with water) and really liked the effect so much, that the scraps on the front of the card started looking ugly. 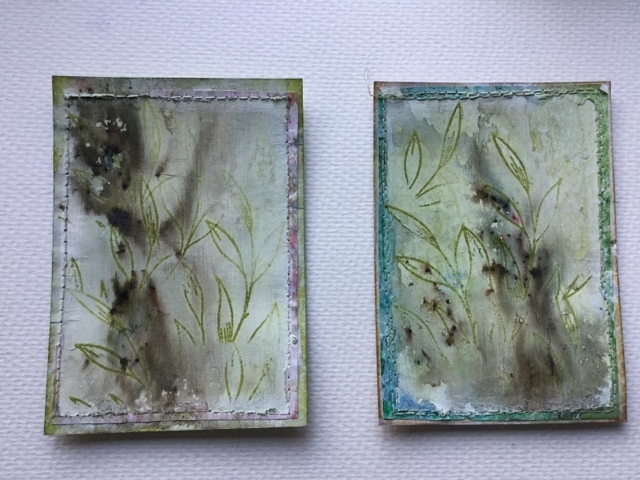 So I tore the fronts off, added gesso, infusions and some stamping. They got a bit warped, but the frame is quite cool. As with my previous cards, I picked my animals from a wildlife encyclopedia that I've been cutting to pieces. The tinamou is a pheasant-like bird, that has beautiful glossy eggs in different colours. Check this pic from National Geographic! The nocturnal curassow is actually a day-active bird that happens to "sing" by night, hence the name. If you want to listen to the call (a bit like an owls hohoo), click the "listen to recording" on this page. I love your beautiful, exotic backgrounds, they are perfect for your exotic birds. 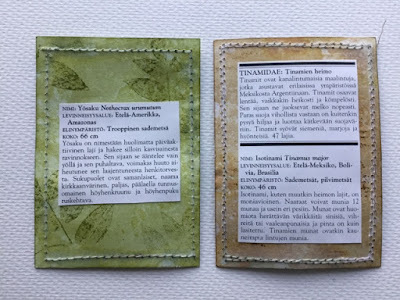 I love your bird and animal cards. Very well done. Especially like the card for " i" and the way the paint has highlighted the lower left hand corner.